The Acu-Brain is a Brain-Spirit (Mind) Operator that communicates with the universe via creating the Keys that correspond to the pre-coded Locks of the universe. These Locks are created in the Big Bang and co-created by both modern (Left-Brain) and ancient (Right-Brain) Quantum Observers. In short, all Quantum Observation is connected to the Acu-Brain’s Tree of Life Mandala. It works by the lock-key mechanism [inside the Logic-Information Vacuum], as defined in previous postings. The Lock is the elements pre-coded in the tree of life. The Key is to pin-point those elements the Observer needs, hidden in the Lock pre-coded inside the Tree of Life Mandala. The ten circles are the ten Acu-Point Logic-Information Potentials [Information Monopoles] listed in the posting: 3-Stages of Spirit—Soul—Body Health & Acu-Brain. In the Tree of Life, they are the Sephiroth and represent Non-Local creation. The twenty two paths are points of reference that direct the Logic-Information flows. These flows formed the Local–Non-Local constrained Information-Energy paths communication amongst the Ten Logic-Information Potentials, the Information-Energy Path, and the Aether in a Holon formed by these three components. Thus, these 22 Information-Energy Paths are formulated by the Ancient Quantum Observers, and thus represent the unification of ancient right-brain dominated science, now referred to as Radionics [notice, no such thing as just right brain or just left brain]. The 22-Information-Energy paths are further constrained [and hidden inside the Tree of Life Mandala] by 5 stabilized potentials. e.g., the 5 consonances in Hebrew letters, the 5 elements in both the I-Ching and the Tarot. The function of these 5 is to stabilize the 22. 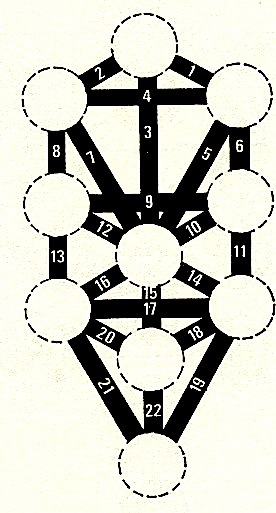 In conclusion, the Tree of Life contains 22 Information-Energy paths that are stabilized by 5 sets of constraints. These 27 elements in various points of references represent the major formula of the Ancient Observer and are encoded in the Vacuum Computer. In addition, the mathematics of superstrings is also connected to this number 27. This number 27 is also connected to the Find Structure Constant 137, and the 27 S–B–D isotopes (nuclear tunneling elements) that collapsed onto 81 stable atomic elements. The connection to superstrings is through the mathematics of an orbifold. In the words of David Peat, Superstrings and the Search for the Theory of Everything. 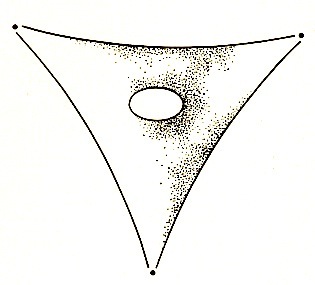 This orbifold space consist of a torus with three special, singular points. Like the torus, it is a two-dimensional surface in a three-dimensional space. By combining three such orbifolds together, it is possible to generate a six-dimensional space with 3 x 3 x 3 = 27 singular points. Such orbifolds are used in string theory to represent the space generated when the original ten-dimensional space compactifies. Notice, this six-dimensional triangle, as shown below, is used by the Matter-Being Paradigm as the Holon Mandala for the nine-components in mind-soul-spirit, etc. Notice, each vortex can also be a single element. The connections to the Fine Structure Constant 137 will be discussed in the section that follows. The connections to the S-B-D Isotope collapsed onto 81 stable atomic elements are derived in the Book and in other posting of this Website (e.g., QA: What is Spiritual Chemistry). Using these ancient-modern connections to this number 27 formulated in the Tree of Life, I shall make the following conjecture within the Matter-Being Paradigm, the quantum Locks in the universe’s creation pre-coded from the Big Bang plus those locks co-created (and self-encoded in the Vacuum Computer) by past, present, and potential future quantum observers are hidden in the Tree of Life Mandala. I will show, in this section, that the Three of Life with these 27 elements represent not only the Logic-Information formulas of the Ancient Quantum Observer, but also the Logic-Information formulas of the Modern Quantum Observer. Let us begin with the Ancient GNOSIS teachings on the numerical number that represents TRUTH, which is 64. The GNOSIS further teaches that this TRUTH consists of a hidden part and a visible part, as shown below. Return to the Tree of Life, the 27 hidden parts of truth are the stabilized Information-Energy Paths that connect the Lock with the Key. The Lock is the Pre-Coded Ten Logic-Information Potentials. Therefore, the 27 hidden parts of truth are the hidden formula on Information crossover and Energy collapses. In other words, the Ten represent spiritual potential, while the 27 has to do with the un-manifested soul-spirit communications, therefore they are hidden. Thus, when the un-manifested become manifested, the hidden truth will become the visible and the 10 can now be combined with 27 to form 37, the visible part of truth [Logic-Information crossover onto Information-Energy]. When the lock is opened, we then have co-creation [collapsed Information-Energy onto forming the Physical World], namely the final TRUTH, that is 37 + 27 = 64 the TRUTH. With the two number 37 and 27 introduced, calculation of the Fine Structure Constant is simple. Notice, Base-9 math does not involve powers of 10(s). Powers of 10(s) in Base-9 has to do with gnomonic expansion-contraction. What we have here is the relationship between the visible and invisible parts of the universe. Finally, we can conclude that the Fine Structure Constant could be viewed as the Constant that binds Matter with Being. 27 S-B-D Isotopes, nuclear tunneling elements between the Logic-Information Potentials in the 173 Bio-Atomic Table and the Information-Energy Paths of this table. These are the Point of References for the Acu-Brain; namely The Acu-Brain’s SOUL PATHS. In addition, by Gematria, the Locus of the Unseen God is 37 x 27 = 999. 137 Fine Structure Constant <—-> 36 to 72 Octaves, SPIRIT-SOUL collapsed in co-creating all Physical Constants and 3-D Space, representing the Universe’s BODY-BRAIN. It is through this Binding Constant that the statement: As Above, So, It is Below satisfied. Remember, this is a first attempt in this Ancient-Modern, Wisdom-Science, and Creation-Cosmology synthesis.there should be many needed improvements in the details. Neverthelest, this is the starting point. The Acu-Brain is one of the Local–Non-Local connecting branches for the above 10—137—27 Holon. All these connecting Branches and their constraints form the “Virtual-Structure” of the Self-Programmable Vacuum Computer. We can now return to answer the question posted: How does the Acu-Brain Work. The working of this Acu-Brain is in the Local–Non-Local connectivity of all its branches where the Acu-Brain is an important branch. In fact, a conjecture here, is that it is this Acu-Brain branch that quantum observation is possible. The reasons for this conjecture statement are (1) Acu-Points and their circuits are the physiology for the Human Spirit, (2) not only, the universe’s involution-evolution is centered within the Human Spirit, but finally (3) the initial-final conditions of the Universe pre-coded are also centered within the Human Spirit whose mind-soul-spirit physiology is Acu-Points. This is the brain-heart connections by the Acu-Point circuits between 靈 -魂-魄 and 身-心-靈 as diagrammed in posting, QA: What is Human’s Place in the Universe. Why the Quantum? The world seems to be profoundly quantum mechanical at its foundations. Quantum mechanics is a general theory that appears to apply to everything, but its peculiar effects are most noticeable on small scales—like those of the atom. A Participatory Universe: Perhaps Wheeler’s boldest speculation is that we live in a participatory universe—one in which the presence of conscious observers at some late date in the universe, like right now, is mysteriously but intimately connected to the emergence of the universe long ago. Quantum theory has always had a critical role for the “observer” and it appears as though certain events cannot occur in the absence of an observer. Wheeler has highlighted the fact that there are many potential events in the distant past that cannot occur until an observer makes them happen. A Participatory Universe: “It from Bit,:” Could the appearance of the universe be such an event? If observers are required in order for quantum events to occur, how could the universe appear? Is there some mechanism by which present observers mysteriously “cause” the universe to appear 1 billion years ago? “It from Bit” is Wheeler’s clever phrase highlighting the ultimate “chicken and egg” question, which he answers like this, “All things physical are information—theoretic in origin.” All the particles in the universe, for example, have certain precisely specified properties. Take electrons: they all have the same mass, charge, magnetic moment and so on. These electrons came into existence after the big bang from what appears to be a pre-existing informational blueprint that specified what electrons would be like, before there were any. How do the physical electrons—the It—come from the blueprint, the Bit? Is there a way to turn Bit into It? Is information somehow more basic and fundamental than matter or energy? Remember, there are also three levels to the Acu-Brain because there are three levels of Mind-Soul-Spirit in each of the three Octave Levels. In fact, the three Octave Levels are Mind-Spirit-Spirit —> Mind-3 x Soul-3 x Spirit-3 = 27.